Marvel Studios has unveiled two new Avengers: Endgame international posters and they tease a Hulk/Bruce Banner mystery. These new looks at the movie very well could be the best looking art released for the movie so far and they also raise a few questions. The promotional tour for Endgame is currently underway and Marvel Cinematic Universe fans are desperately waiting for Mark Ruffalo to come through and spoil something major about the move. However, it seems that the actor has truly learned his lesson about that sort of thing, which is a shame. Speaking of Mark Ruffalo, his Bruce Banner character is featured in one of the new Avengers: Endgame posters. This isn't a shock since he's been in all of the others. But, he is pictured in the Hulkbuster suit from Infinity War. We haven't seen Hulk in any of the posters and this seems to indicate Hulk might still have beef with Banner when Endgame hits theaters. Both posters have the Avengers compound in the background and it looks like Earth's Mightiest Heroes are gearing up for a battle with Thanos there. If the battle at the Avengers compound ends up happening in the movie, which it probably will, Bruce Banner might have to be in the Hulkbuster suit because he doesn't expect Hulk to want to come out and fight after what happened in Infinity War. Another interesting look to the latest Avengers: Endgame posters is the addition of Okoye on the Avengers compound. She has been pictured in other promotional material, but not like this. With that being said, this could all be artistic license used to not give anything about the movie away. 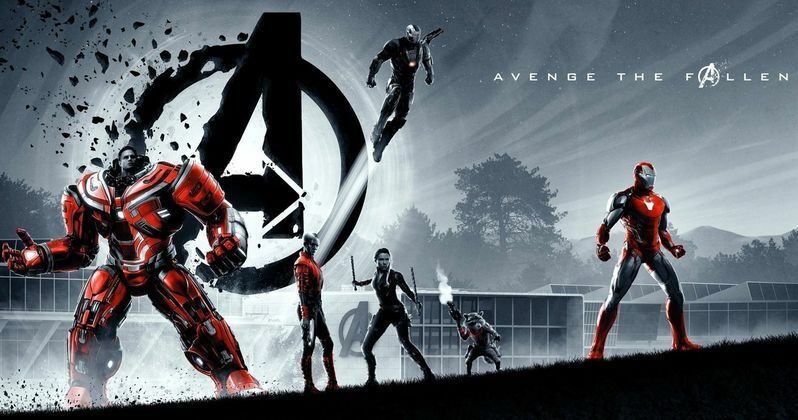 As for the aesthetic of the Avengers: Endgame posters, they both have a black, white, gray, and red color scheme, which makes them look particularly dark and foreboding. They show the crumbling Avengers "A" logo either turning to dust, or reassembling like we have seen from the trailers with "Avenge the Fallen" written on the right side of one poster and the left on the other. These are really well-done and would be a welcome addition to any MCU fan's collection. They were done by artist Matt Ferguson and they are Odeon exclusives. The first one is to be given away at UK showings between April 25th and 28th and the second one May 4th - 5th. Avengers: Endgame is on the way and we still have no idea what exactly will happen, which is exciting for some fans and incredibly tough to take for others. We have seen promotional art and the trailers and accompanying TV spots, but there is still so much remaining to be a mystery and that's exactly the way Marvel Studios wants it to be. They have taken secrecy on a movie production to the next level and elevated it to an artform. While we wait for Avengers: Endgame to hit theaters, you can check out the two latest posters below, thanks to the Marvel Studios Twitter account.